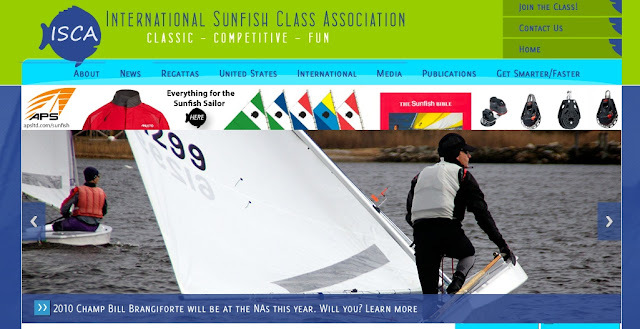 After several months of effort, the International Sunfish Class Association has unveiled their new web site. The site is a huge improvement over the old one, and should make life easier for everyone. Eric Woodman, the New England Class Representative, and Rich Chapman, Class President both deserve a big thank you and round of applause from the entire fleet for spearheading this site redesign. I’m thrilled to announce that the new Sunfish Class website is live at the same old URL: http://sunfishclass.org! Getting this site created has been a multi-year effort and something of a personal crusade for me. It was designed and built by WebWorks Café, a San-Diego based company that the class contracted with at the end of 2012. I think you will find that it’s a significant step forward for class communication, branding and general well-being. Among the things the new site enables is joining the class online/renewing membership. It will also be self-sufficient, via the sale of online ads. I think you will find it visually exciting and a reflection of what makes our odd little boats so much fun to sail and what makes the Sunfish Class unique in the sailing world – that’s what we were going for anyway! The site includes pages for each region. Here you will find the racing calendar, news, events, words of wisdom, etc. Bookmark this page! I urge everyone reading this to visit the site, take a look around, provide feedback (we are well aware that the content is a work in progress and will be only improved by contributions from people like you), join/renew your Class membership and visit the sponsors. It’s important that you not only support advertisers on the site but do so by clicking on their ads from the class site (they will know if people are doing this and it will help reinforce that advertising with us is a wise investment). Let me know if you are interested in advertising on the site (we can have your ad limited to New England, if you want). Credit should go to USCA President Rich Chapman, who since his election last summer has managed to push the rest of the Class Leadership to support investing in online communications. Now that the site is done, I can get back to being more involved with keeping you all up to date on what’s going on. It’s been a lot of work! nice post - I just noticed the updated website as well. Eric has worked really hard over the winter to get the new site approved and built in time for the start of the racing season. He deserves a round of applause from the entire class.